You haven't seen a real yard sale on a mountain -- one of those sick, equipment strewn everywhere sort of crashes -- until you've witnessed a speed skier wiping out. Try hitting 150 mph down the slope when you perform your next mackerel slap, that fish move where you fall down so suddenly you don't remember how you got yourself in that pretzel-shaped, call-the-ski-patrol heap. "Last year I fell going that fast," says two-time defending world speed skiing champ Jeff Hamilton from his new home near Aspen in Basalt, Colo. "You fly, thank goodness. "PEOPLE THINK IT WOULD BE IMMEDIATE death, but you don't have anything to hit." Speed skiing courses aren't lined with gates or hay bales or trees. But gravity being what it is, the airborne speed skier (who brings new meaning to the freestyle skiing term "aerials") must eventually touch down. Hamilton, who is 30 and was the first human to ski 150 mph, flew the length of about four football fields before he landed after his flash fall. That's when he thought his rubber suit was going to burst into flames. "It hurts like you cannot believe," he says about his so-called reentry into the workaday world, where this native Californian owns and operates his own ski shop. He didn't break anything in his bid to push back the speed envelope. But, Jeff Hamilton says, "My body was black and blue. I raced a week later in Sweden. I had to -- it was for the world championship." HE GAINED THE TITLE AGAIN in spite of the pain. But he has lost the world record to Frenchman Phillipe Billy. "I'm the best speed skier in the world," Hamilton says, matter-of-factly. "I want that record back." How does someone find himself on a pair of planks going faster than most cars on the road today? Hamilton can go zero to 100 in 5 seconds. He says it has been proven speed skiers accelerate faster than skydivers jumping from airplanes. You haven't free fallen until you've tripped while speed skiing. And there's no parachute to soften the landing. So where do you turn if you want to sonic schuss? "Nowadays there's public tracks around the U.S.," Hamilton says. "That's the best way to start. I went to a random race, then went to Europe." THAT'S THE QUICK READ on his rapid ascent in this ageless sport. 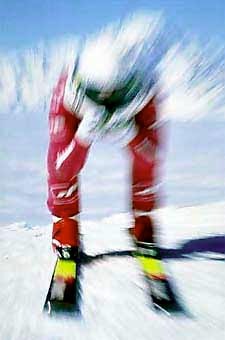 The reason he went to Europe, where speed skiing is Alp big, was because he made the final 20 out of 120 entrants in his first race in 1990. "I decided, 'That's not bad for a first-time attempt. I'm going to give this a try,'" Hamilton recalls. Steve McKinney, the brother of three-time Olympian Tamara McKinney, never made the A team in Alpine. But he did set the standard for speed skiers. "McKinney introduced rubberized suits and aerodynamic helmets," says Hamilton, who looks like a spaceman when he's flying down a half-mile hill to that 100-meter speed trap where he gets clocked. It takes another half-mile to slow to a stop. "Straight down the hill. People think it's a fresh sport, but it's old. It has its roots forever." Man has tried to max out since he first went over a hill on a pair of cross-country skis. It might have been a Viking who introduced schussing to civilization. It was definitely a Norwegian, Jens Henrick Emahusen, who wrote the first rules of skiing in 1733. Alpine racing began 100 years ago in Europe. How fast the traditional downhiller goes depends on the individual's skill level. "If you're good, 60 mph is definitely attainable," Hamilton says. "But speeding is sort of frowned upon at ski resorts." IMAGINE WHAT A LIFT OPERATOR would think if he knew one of the world's fast skiers was in his line. Not that he'd know it was Hamilton. "I'm not a household name and you wouldn't recognize me, even though I have ads," he says, referring to his appearances in national magazine advertisements for Sector watches. He is part of the No Limits Sector Team. "When people meet me they say, 'Oh, yeah, you're the guy.' They think I'm crazy or a speed nut. They talk to me and find out I'm pretty normal. I'm not crazy crazy." Besides, he says, when he is skiing for recreation he likes to turn as much as he enjoy going straight. "I make my money going fast. I love going fast. But I'm in the powder and the trees, too." Dear old dad is another story. Hamilton's father taught Jeff how to ski when he was four. And before long the junior Hamilton was a junior racer. Now he is king of the mountain. Not that he blows by his father when they ski together. "He still goes as quickly as he can," Jeff Hamilton says about dad. "He's the guy you say watch out for. He taught me how to go straight and to go fast." He also must have taught him the art of walking away from a high-speed crash. Copyright © 1997 SportsLine USA, Inc. All rights reserved.